We have just heard the tragic news this week that Kenneth Clawson has died following a long and brave fight against Leukemia. Kenneth was a very special and much admired man. He did a huge amount training the British event riders and was responsible for many a Team GB medal. He was always an inspiration to me with a deep understanding of horses and riders, particularly when under pressure. Our deepest sympathy goes to Paul and his family at such a sad time. We will certainly miss him greatly but feel very fortunate to have many fond memories and to have shared some fantastic moments. 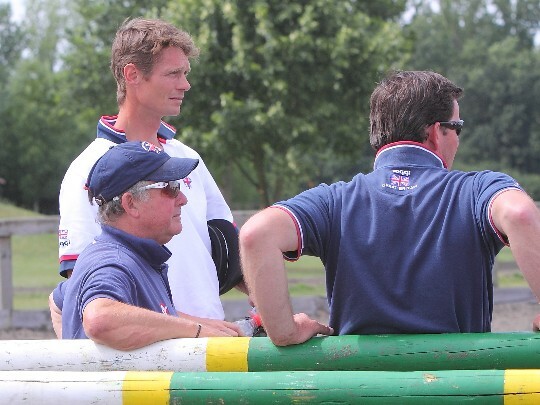 William, Kenneth and Peter Murphy during a Team GB training session. Thanks to Fiona Scott-Maxwell for the picture.